How to find the church? Hrozová village lies in the southern part of Osoblažský promontory. At present time the village is a part of Rusín village. The first written document about Hrozová village comes from the 13th century. At that time, the village belonged to Konrád of Koberno, the son of Herbord of Fulštejn. Herbord was given the Fulštejn land (present Bohušov) as a fief. Hrozová village was connected to Fulštjen since 1566. 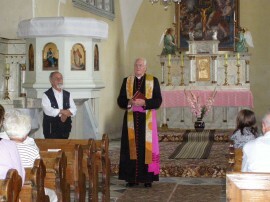 The church is the most important monument in the village. It is consecrated to St. Michael Archangel and it was firstly mentioned already in 1309 as well as the village. The area of a parish church together with a wall around a surrounding cemetery is on the list of real cultural monuments. The core of the church is an early Gothic building from the 13th cenutry, which was modified for a few times. A sacristy was built to the church in the 15th century and so was an oratory later in the 19th century. In 1758 windows were modified from Gothic to Baroque ones. In the 19th century many construction works were done such as roof timber change, built up a new southern entrance hall, a four-side tower was reconstructed, a new staircase was built and also a marble tiled floor was laid. In the 90´s of the last century, the slate roof was replaced with a metal plated one and in 2004 the stone wall around the cemetery was fixed. In the interior, there is a Neoromanic main altar from 1891, made according to sketches of an Opava artist Paul Assmann. 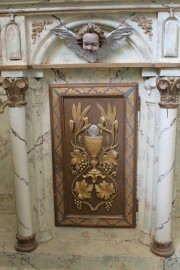 Assmann also participated in decoration of a pulpit with a Neoromanic column and (maybe) frecoes in the archs (unfortunatelly repainted) An altar canvas with a picture of St. Michael Archangel is from 1851, painted by A. Sperlich. A choir loft is made of wood and it is on pseudoromanic columns from 1893. The picture of St. Wenceslas on the horse from 1938 is brought by new settlers from Volyň after World War II. An organ from 1893 is by Rieger Krnov company, however the church probably had the organ already in 1672. In the tower, there are two bells, the smaller one by Hiller company from Brno from 1920 and the larger one by Herold company from Chomutov from 1923. The tower clock from 1926, constructed by Beitel company from Moravský Beroun, was again activated after many years. In 2011 the church underwent the reconstruction of a roof and a façade and a partly archeological survey was held in the interior. 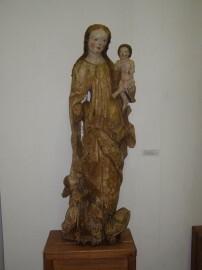 Another monument is the statue of Mary Virgin with baby Jesus (Madonna from Hrozová) found after year 1500. The statue is exhibited in Silesian museum in Opava. The school in Hrozová existed already in 1610 and there was one teacher, who was also an organ player in local church. He lived just behind the church in a school facility. The building is preserved up to now as well as the fire station from1898 and the Art Nouveau rectory with two chapels. In 1950, a unique finding of ancient coins was discovered in Hrozová. 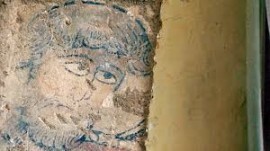 In March 2013, archeologists found frescoes of unique dimension in the church interior. Paintings hidden in the church attracted experts with the size of figures. Revealed frescoes shows that the paintings come from the last third of the 13th century, being very rare in the central Europe. This is the reason why a remote Hrozová village appeared in the first ten most important late Romanic frescoes found in the Czech Republic. Rusín village together with a Heritage institute intend to restore frescoes. At present time the church is being painted. Once the painting works are finished, the church will be freely accessible.